After years of deteriorating conditions at Greenwich, the Observatory moved to Herstmonceux Castle in Sussex. The move began in 1948 and was completed in 1957. The Observatory remained at Herstmonceux until the end of the 1980s when it was moved to Cambridge. Herstmonceux Castle has been described as the finest early brick building in England. Begun in 1441, it had fallen into a state of disrepair by the 1770s. In 1775, it was inherited by the Reverend Robert Hare who lived nearby at Herstmonceux place. Having decided that it was uneconomic to repair, he drew up plans with the architect Samuel Wyatt to dismantle the interior and reuse the materials to extend and remodel Herstmonceux Place. This so upset Thomas Lennard, Lord Dacre, a descendent of the family that had owned the Castle until 1708, that he commissioned James Lamberts of Lewes to create a full set of drawings of the Castle prior to the work commencing. Most of these were completed in 1776. An engraving derived from one of them can be seen below. 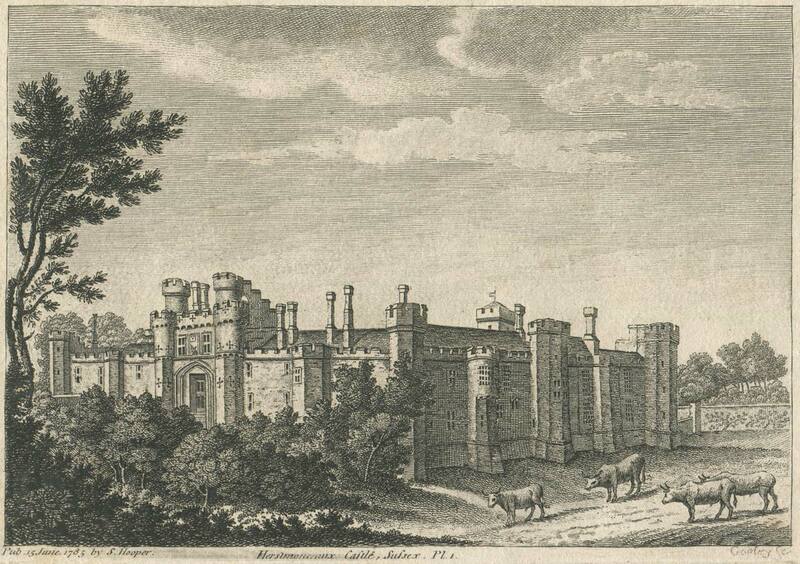 Click here to see more images of the Castle in 1776. 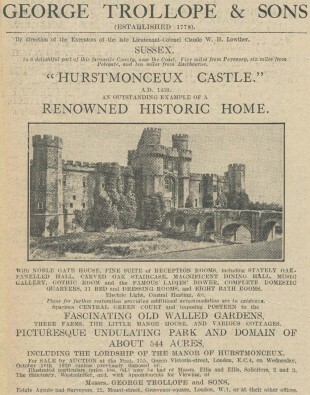 Click here for a plan of the Castle prior to its partial demolition. 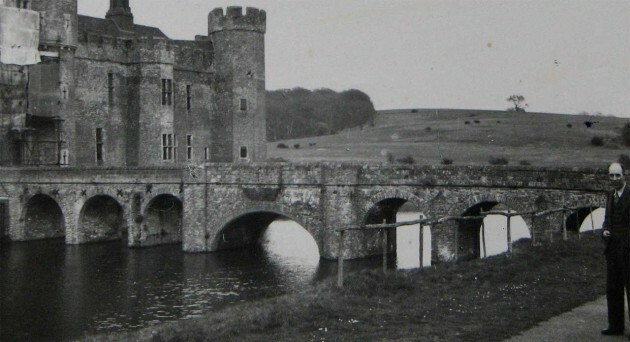 The Castle was partially dismantled in 1777 and remained a picturesque ruin until put up for auction in 1910 along with the surrounding Estate of 732 acres. 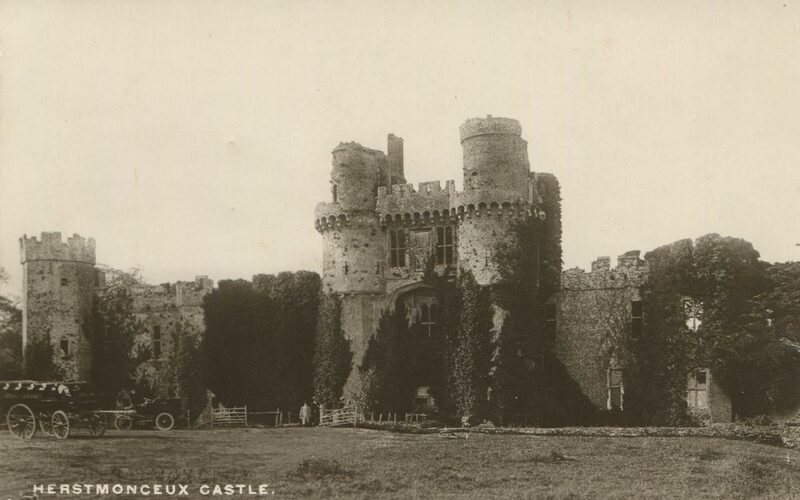 Scheduled to be sold on 19 July, all five lots were sold shortly beforehand to Lieutenant-Colonel Claude Lowther who immediately embarked on the process of converting the Castle back into a habitable residence. Click here to see more images of the ruins. 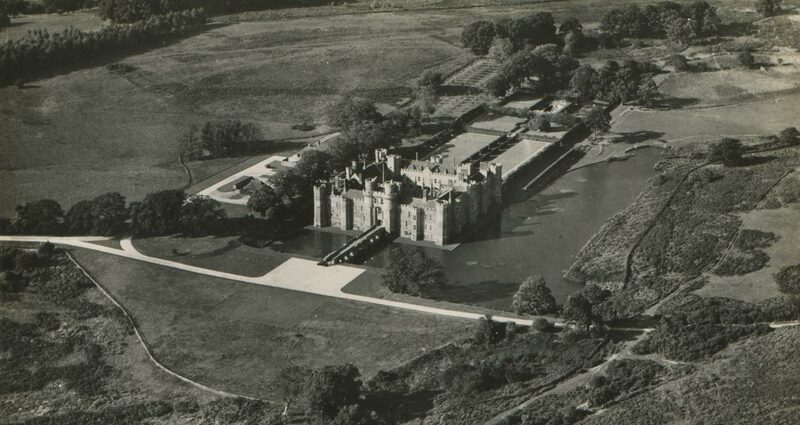 Following Lowther’s death in June 1929, the Castle and Estate (now reduced to 544 acres) were once again put up for auction. A report in The Times on 2 November 1929 states that they were sold for £65,000. The purchaser was Reginald Lawson who went on to commit suicide in December 1930. In August 1932, the Castle with about 540 acres was sold on in a private sale to Sir (Herbert) Paul Latham who continued the process of restoration which he began in 1933 and had completed by 1935. The present interiors date largely from his and Lowther’s time and incorporate architectural antiques from England and France. Some estimates put the amount spent by Latham on the Castle’s restoration and modernisation at not much short of £250,000. More informed sources however put the figure at £60,000 (ADM1/25217). Having completed the restoration work, Latham only lived in the Castle for a few more years as a result of it being requisitioned during the Second World War and occupied from 1939 until September 1945 by the Hearts of Oak Benefit Society, whose headquarters were evacuated there from London. Meanwhile, Latham, who had been elected to parliament in 1931, decided to sign up for military serviced during the war (despite the fact that as a member of parliament he was exempted). His wife, whom he had married in 1933, then divorced him in America in May 1941 on the grounds of mental cruelty. A few months later, in August, he ‘resigned’ his parliamentary seat (by accepting the appointment of Steward and Bailiff of the Manor of Northstead) following his arrest for ‘alleged offences against military law’; the alleged offences relating to homosexual acts (illegal at the time) with three gunners and a civilian. He then tried unsuccessfully to commit suicide. At his court martial that September, he was found guilty on eleven of fourteen charges and sent to prison for two years. In February 1944, the Admiralty approved in principle the removal of the Observatory from Greenwich to a site elsewhere. 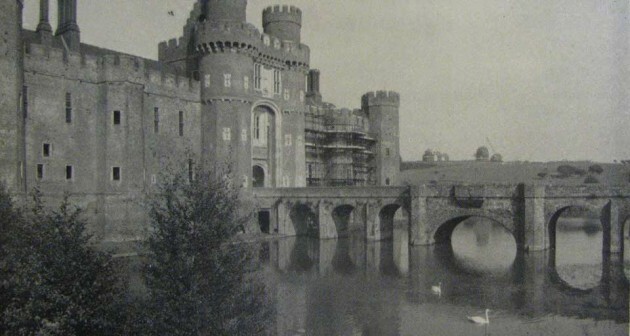 Over 70 possible sites were then considered from which a long list of 16 (including Herstmonceux Castle, were inspected at the end of April and beginning of May 1944. From these, a short list of five was compiled by the Astronomer Royal in consultation with the Department of the Civil Engineer-in-Chief, Admiralty, the Director of the Meteorological Office, and the Director of the geological Survey. All were substantial country estates in the south of England that had been requisitioned for the war effort. They were all visited between 15 and 17 April 1945 by a subcommittee of the Visitors along with the Astronomer Royal (ADM1/25217). 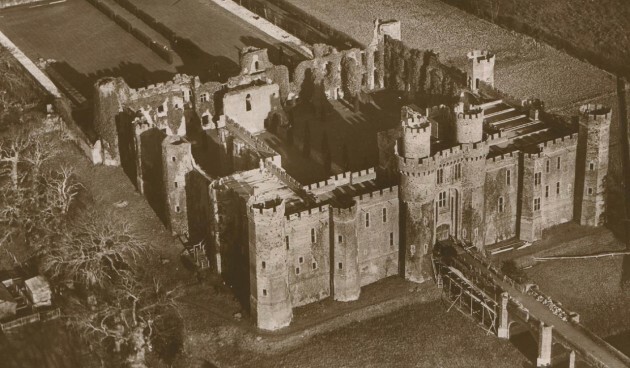 Three of the sites were then eliminated, leaving just Herstmonceux Castle and Amport House in the running, with Herstmonceux the preferred choice. The final decision to settle on Herstmonceux Castle as the new home was made with Royal approval at the end of November 1945. 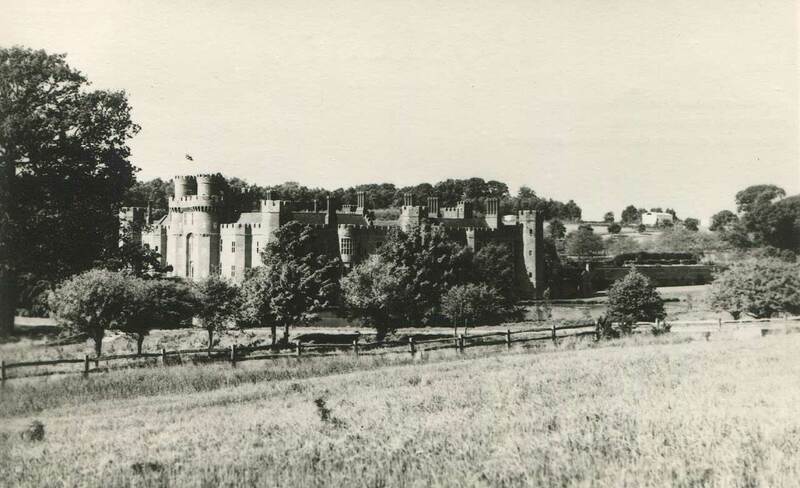 On 11 April 1946, the Admiralty announced that the Castle had been selected as the Observatory’s new home and on 18 February 1947 it formally acquired the Castle and surrounding estate of 368 acres from Latham for the sum of £70,000 plus an additional £6,000 for the temporary building that had been erected by the Hearts of Oak Friendly Society, which he had subsequently purchased from them. At that time the Admiralty made its purchase, there was an expectation (based on an analysis made in October 1945) that a further £225,000 would be required for modifications and further building works, which were initially scheduled to take place in three stages. Click here to read more about how the Herstmonceux site was selected. In 1948, the move finally began and the Observatory was renamed: The Royal Greenwich Observatory Herstmonceux. In practice, this title was seldom used, a contracted version – The Royal Greenwich Observatory – being used in preference. Despite the enormous sums spent by Lowther and Latham, once the Admiralty had taken possession of the Castle, further essential works were soon found to be necessary. Within 18 months, these together with other unforeseen costs lead to a doubling of the estimate for the additional works required by the Observatory from £225,000 to £450,000. One of the plus points from the Astronomer Royal’s point of view, were the considerable number of temporary wartime buildings or hutments that came with the Castle. 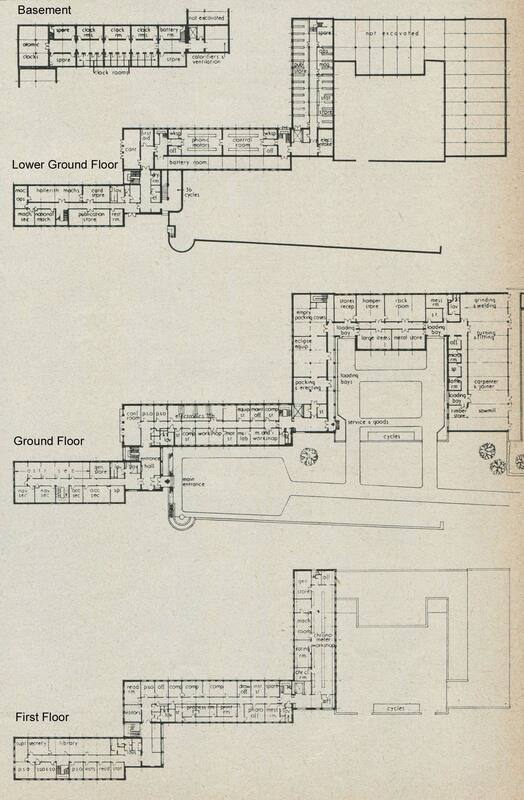 Between them, they had a total floor area (excluding the corridors) of 33,640 square feet (ADM1/25217). One (which had been used as a canteen) was located in the internal courtyard of the Castle. The remainder were immediately to the Castle’s south in front of the main entrance. Some of these had been erected to provide living quarters for the Society’s staff and were put to use straight away as a hostel for workmen from the Civil Engineering section of Chatham Dockyard, who were brought in by the Admiralty to make the necessary alterations and erect the new buildings required. The first of the Observatory staff to move to Herstmonceux were the Astronomer Royal and his secretariat. They arrived in August 1948 from their wartime base at Abinger. The Astronomer Royal was provided with an apartment within the Castle (for which he paid a rent of £150 a year). The Head Messenger took up residence in the cottage adjacent to and just north of the Castle’s west entrance at a rent of 17/6 (87½p) per week. Of the other seven cottages on the estate, only three were available for occupation and they had already been let to Admiralty staff – the two garage cottages to employees from Chatham at 22/6 and 25 shillings a week, and the West Lodge to Mr C Dann, the Head Gardener at £55 per year. Of the later Directors, only Margaret Burbidge took up residence within the Castle. Meanwhile, the local council had been consulted. It made the promise of a special allocation of council housing. But this still had to be built, and was in any case only going to be available to married members of staff. Nor was any housing going to be provided (at least for the foreseeable future) for staff not already employed at the time of the move – rather unfortunate, since Spencer Jones had been given permission to increase the staffing complement. At around the time that the Astronomer Royal was moving into the Castle, six houses became available a year earlier than had been expected. Located on the nearby Bagham Lane estate, they were sufficient in number to accommodate the staff of the chronometer department. The move of this department from its wartime base in Bradford on Avon, took place in September 1948. Unfortunately for these incumbents, their presence in the village was resented – no doubt in part, because they had been able to jump the housing waiting list. 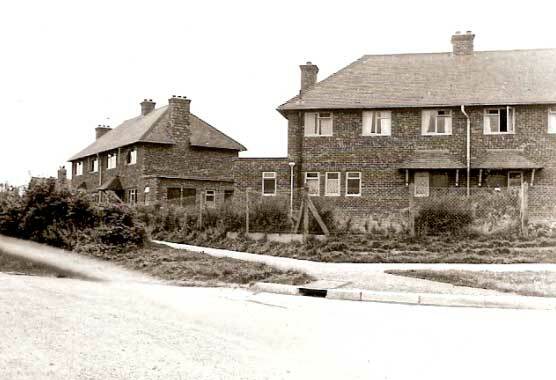 By the 1950s however, with more houses built, new arrivals from the Observatory were given a warmer welcome. For the more senior staff, Spencer Jones sought funding from the Admiralty to have superior housing built on the perimeter of the Observatory property. Getting nowhere, he made similar approaches to the council, who declined to cooperate, believing demand for such houses would be small once they were vacated by the Observatory staff. In one final attempt, Spencer Jones again approached the Admiralty to see if they would provide official housing for the more senior of the night observing staff. They declined. Some staff bought their own house. 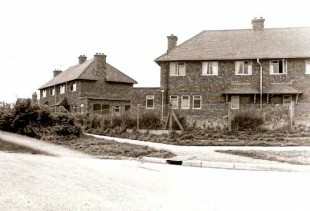 Others, including the more junior staff who were not in the hostel or council houses, lodged nearby – for example on the coast at Pevensey. Not all the wartime buildings were put to use as a hostel. Some were allocated to various departments and others for storage. The Castle, as well as being home to the Astronomer Royal and housing the canteen, was also used as office accommodation until the West Building was erected. The library was installed in the Great Hall – but before this could happen, the floor required considerable strengthening in order to take the weight of the books. 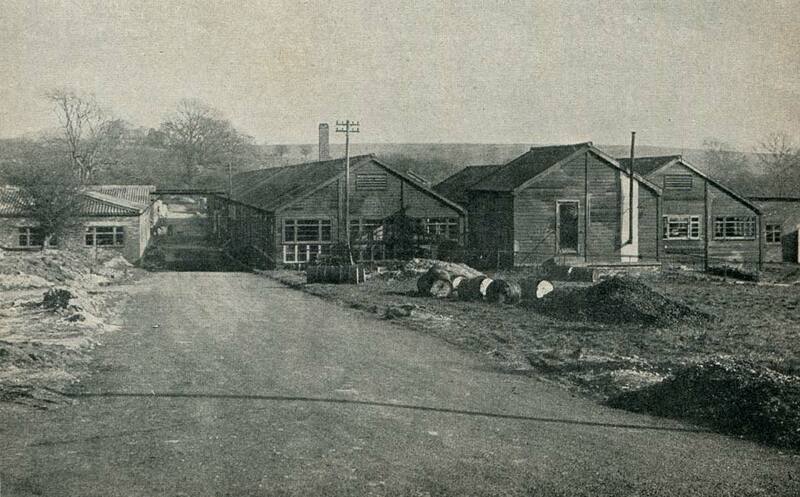 The first of the wartime buildings to be demolished was the hut in the courtyard, which was removed in 1952/3. 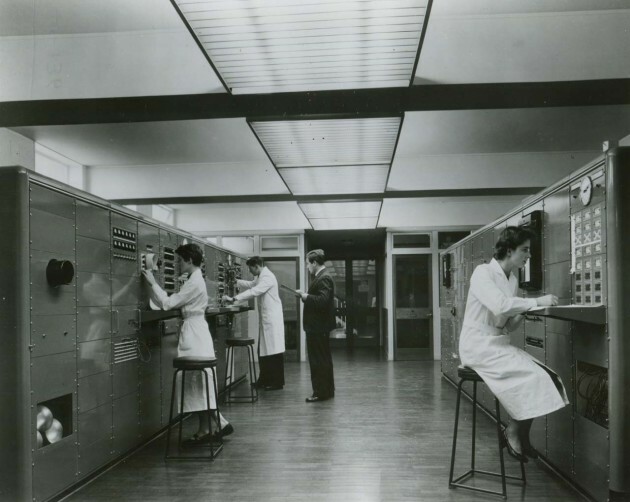 Apart from a number of air raid shelters, the rest were cleared in early 1958, after the completion of the West Building and the Equatorial Group. The last of the air raid shelters were removed in 1977/8. The first dome to be built was the Solar Dome. The site chosen was located about 275 metres to the south-west of the Castle. In 1946, a Mr Newbegin from Worthing had made the offer of a gift to the Observatory of his 6¼-inch Cooke refractor along with its dome. The offer was accepted and Spencer Jones lost no time in having a new building constructed, with a view to mounting the Greenwich photoheliograph piggyback on the refractor within. Click here to read about the Greenwich and Newbegin spectrohelioscopes. Largely designed by Robert Atkinson (Spencer Jones’ Chief Assistant), the Solar Dome was built by staff from the Chatham Dockyard under the direction of their Civil Engineer-in-chief. So successful and well rehearsed was the relocation of the photoheliograph, that when it was moved on 2 May 1949, photographs were taken at both Greenwich and Herstmonceux on the same day, and the continuity of the “Greenwich” solar record maintained. A separate cellar to the east of the Building to house a spectroheliograph was constructed later and completed in 1951. Daily observations of sunspots and other solar phenomena ceased in 1977, at which point the photoheliographic programme was transferred to the Heliosphysical Observatory, Debrecen, Hungary. The Newbegin telescope and photoheliograph were acquired in 1980 by the National Maritime Museum for £250. 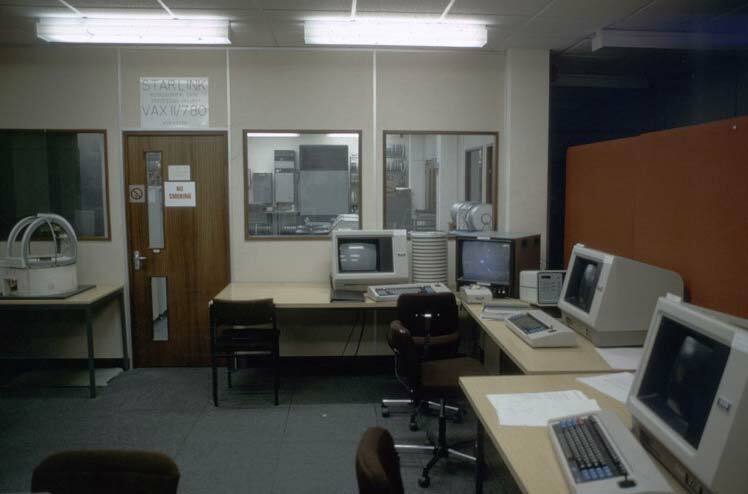 The building subsequently became the home of a Satellite Laser Ranging facility (see below). The technical success of the Solar Dome was marred by objections to its appearance and an unfortunate interview that Atkinson gave to The Times in January 1949, when it surfaced that no ‘formal architect’ had been employed. The matter was raised in Parliament on 2 February and again on 25 March and commitments made that the Royal Fine Art Commission would be consulted over the design of future buildings. In terms of the final cost and additional delays, this turned out to be a disaster. The Commission made its first visit to the site on 2 April. At Greenwich, the Admiralty had been able to build more or less as it liked and typically did so in the manner described above. But The Town and Country planning Act 1947 which came into force while the Solar Dome was being built put an end to this. It required the views of others to be taken into account. The Admiralty bowed to the inevitable and in January 1950, it announced that Brian O’Rorke – who had designed many successful interiors for the Orient Steam Navigation Company – had been appointed as consulting architect for the scheme as a whole. The Equatorial Group is the name given to the cluster of six domes to the east of the Castle. They were designed to house the five large equatorials from Greenwich together with a yet to be designed Schmidt telescope. The six domes were labelled A to F, A being the most north westerly of the group. In a clockwise direction, the order of the domes and the telescopes they were originally designed to house was: dome A (Thompson 30-inch Reflector), dome B (Yapp 36-inch Reflector), dome C (earmarked for a new Schmidt Telescope), dome F (28-inch Refractor), dome D Astrographic Refractor), and dome E (Thompson 26-inch Refractor). The consulting engineers were RT James and Partners. During excavation work for the laying of drainage pipes, six Roman burial urns were uncovered (five containing cremated bones and the other being a food vessel). As well as doing much of the design work for the Solar Dome, Atkinson also did much of the initial design for the Equatorial Group. 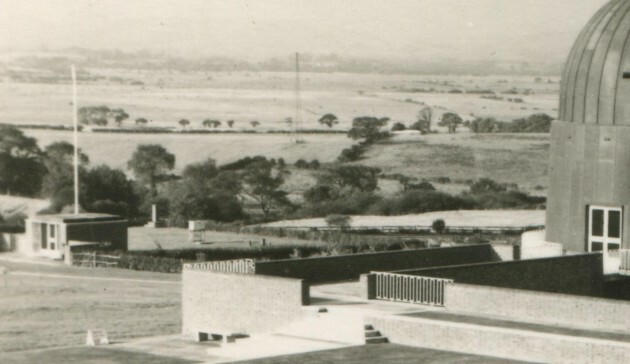 Although this work had been completed in 1949, the intervention of the Royal Fine Art commission, together with other delays caused by O’Rorke’s prioritisation of work for the Festival of Britain and the drip-feeding of funding, pushed the start date for building work back to October 1954. 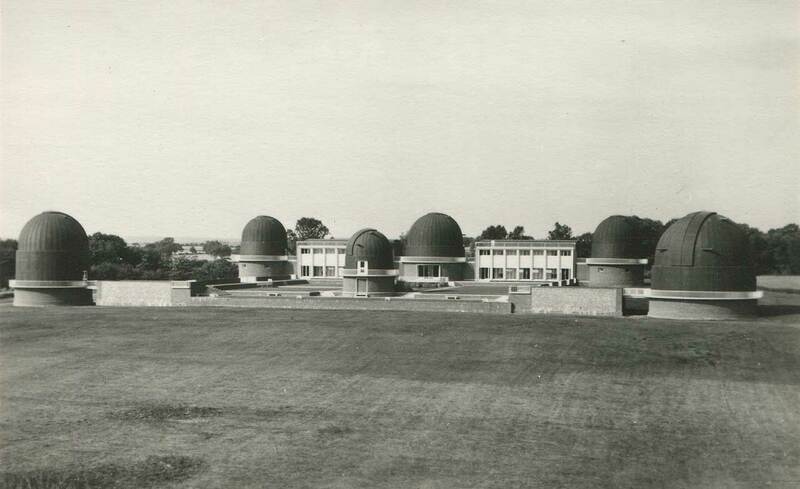 The domes were finally completed in 1958. By then, half the telescopes they had been designed to house, had been idle for the best part of twenty years. 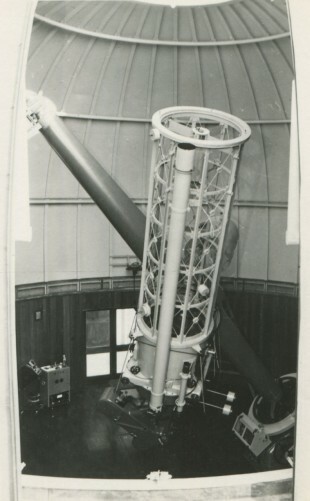 Atkinson’s original concept was that the three domes (A to C) housing the reflecting telescopes should be arranged in a straight line with the 36-inch Yapp (dome B) in the centre so that it could act as a collimator for the other two instruments. For this to be realized, the telescopes needed to be a minimum of about 90 feet apart. Also, when the Yapp tube was horizontal E.W., and above axis, the 30-inch tube (dome A) and the Schmidt tube (dome C) would need to be sited so that they would also be able to be pointed E.W. at the same height, and in the same E.W. line. But as the Yapp with its cross-axis mounting would have its tube about 4 feet south of the centre of the dome when in the position specified, and the other two telescopes which would probably have fork mountings and be centred on their domes, the centre of their domes would need to have their centres 4 feet south of the E.W. line through the centre of the Yapp dome. Atkinson also specified that the domes would be linked at a lower level by a passage without any steps so that the mirrors could easily be transported to an aluminising room leading from it. These aspects of his design along with many others were carried forward into the final design, but the notion of reusing the Yapp dome from Greenwich was abandoned. Although the finished Equatorial Group was regarded by many as visually pleasing, some of the engineering and design solutions compromised the effective working of the telescopes along with the potential safety of the staff. 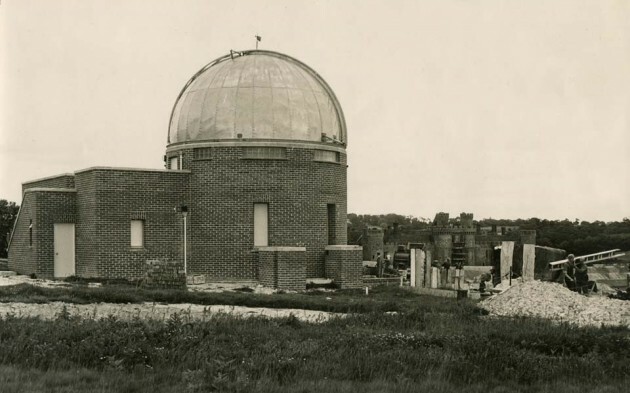 It is difficult to understand why, when darkness was so important, it was deemed appropriate for the observing domes to be interconnected with unfenced elevated walkways and surrounded by ornamental ponds. The safety railings at the side of the "bridge" over the main entrance were belatedly installed in 1961/2. Likewise, the choice of copper for cladding the domes seems perverse. In an ideal world, a telescope and its housing should be at the same temperature as its surroundings. Copper was used on the grounds that as it aged, it would turn green and blend in with the countryside. 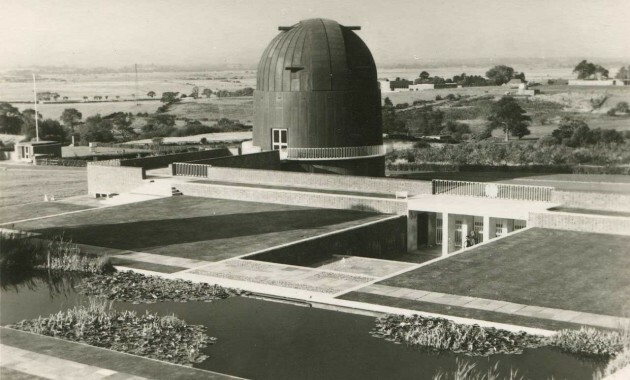 Although the domes were double skinned and insulated, later tests carried out by Roy Wallis suggested that following their opening in the evening, it would take until after dawn for the telescopes within to cool to the temperature of their surroundings. In 1978/9, when testing an acquisition and guidance box that had been built specially for the Yapp telescope, it was found that the telescope did not image as well as its design predicted or with the linear resolution with which modern detectors were then capable. Following an investigation, the finger was pointed at the structure of the dome. The Observatory Report for 1979/80, did not mince its words, stating: ‘The building was originally designed more for aesthetic appearance than for its intended use’ and went on to say that it was very difficult to prevent it heating up during the day, and thereby causing dome-seeing problems as well as mirror deformation as a result of temperature inhomogeneities. The report went onto say that a plan had been drawn up for ameliorating the problem. Further research is required to establish what these plans consisted of and when they were eventually put into action. 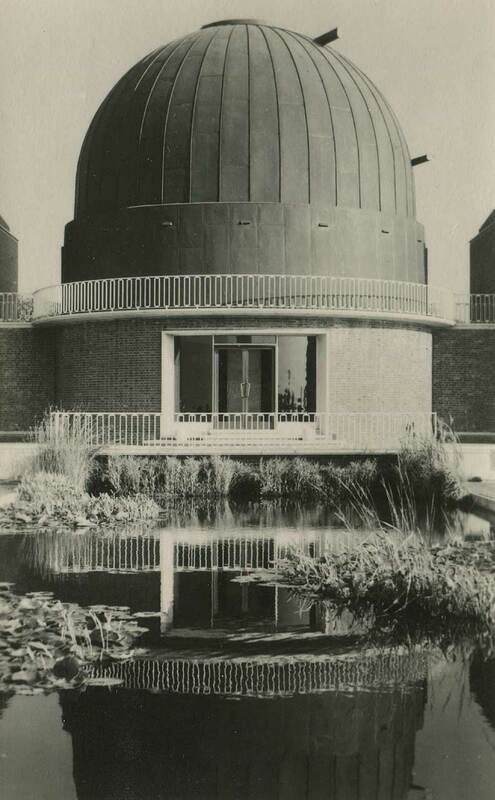 Although criticism for the decision to use copper has traditionally been aimed at the architect, it is worth remembering that the Yapp dome at Greenwich, which was completed in 1933/4, was clad in the same material rather than the more traditional papier mâché. No such aesthetic compromises were made over the finishes for the later Isaac Newton Telescope! The 28-inch refractor was declared redundant and returned to Greenwich in November 1971. When in the mid 1980s, there was a real possibility of the Herstmonceux site being shut down by its then funder, the SERC, discussions were initiated with the National Maritime Museum (who had taken over the care of the Greenwich site), to see if it was willing to take over the Equatorial Group. These discussions came to nothing. Since 1995 the Equatorial Group has been home to the Observatory Science Centre. The building was listed grade II* in March 2003. 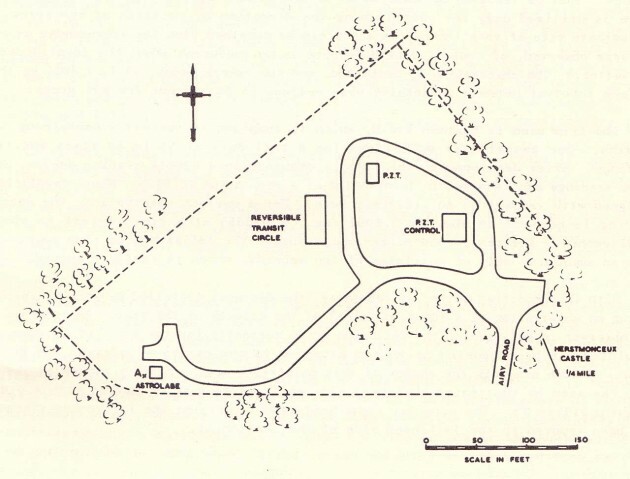 Within months of his appointment as consulting architect for the site in January 1950, O’Rorke had come up with plans for a hut designed to accommodate the anemograph, standard barometer and recording thermometers. 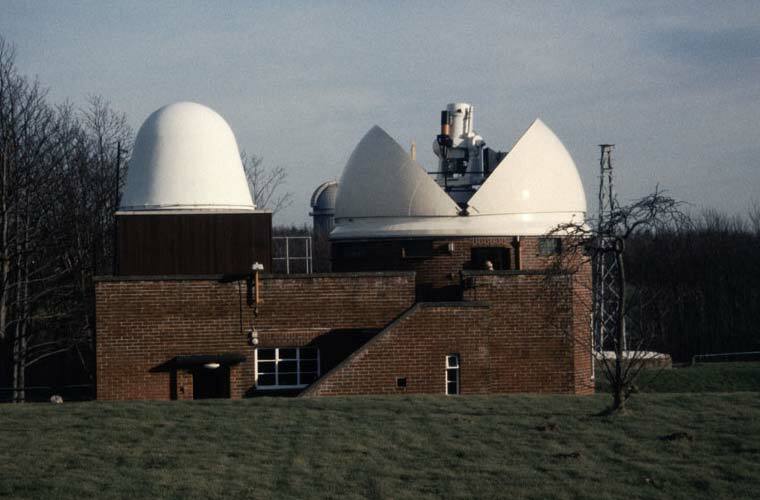 After some delay, the Meteorological Enclosure was completed in 1953, with full-scale measurements commencing on 1 November. Full scale observations were discontinued by Woolley at the end of January 1956. Observations of some sort appear to have continued until at least 1960/61 when the magnetic and meteorological department was renamed as the Magnetic Department. 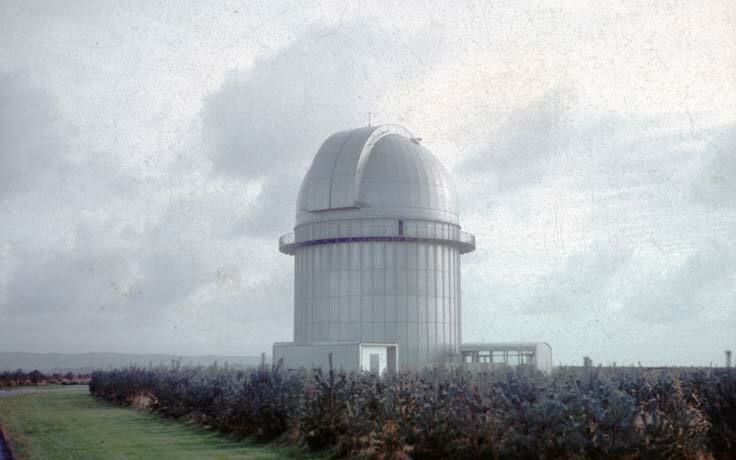 Full scale observations recommenced in 1976/7 when permission was given to the Meteorological Office to set up a small observing station within the Observatory grounds in order to fill a gap in their South Coast Chain. The original enclosure still exists. Located to the east of the Castle, it can be found immediately to the south-west of the equatorial group, by the ticketing hut to the Castle. Today, the site is occupied by QRZ Amateur Radio Group of Sussex. Originally known as the Meridian Group, this cluster of buildings to the north of the Castle housed the meridian instruments for positional astronomy and time determination. The name Spencer Jones Group was adopted in 1961 in memory of the late Sir Harold Spencer Jones at the recommendation of the Board of Visitors. The group consisted of four buildings – a large pavilion for the Cooke Reversible Transit Circle (RTC) and two smaller ones: the first for a newly commissioned Photographic Zenith Tube (PZT) and the second for a small transit instrument. 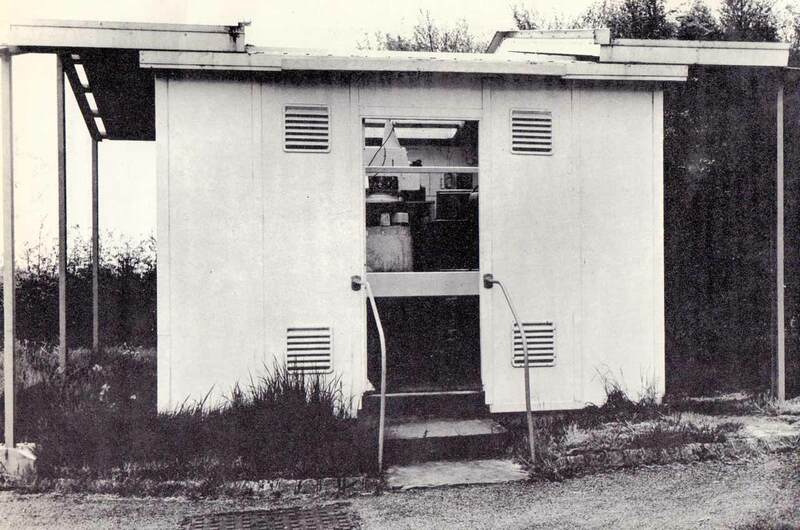 Alongside these, the Admiralty constructed a small building, comprising the control room for the PZT, an observers’ room and accessory services. Space was also allocated for a building to house a possible mirror transit circle. This never materialised. The design criteria forced upon the equatorial group of buildings, were fortunately not applied to the buildings for the meridian instruments, responsibility for these being largely retained by the Civil Engineer-in-Chief. The finished buildings were all of a utilitarian and shed-like nature. 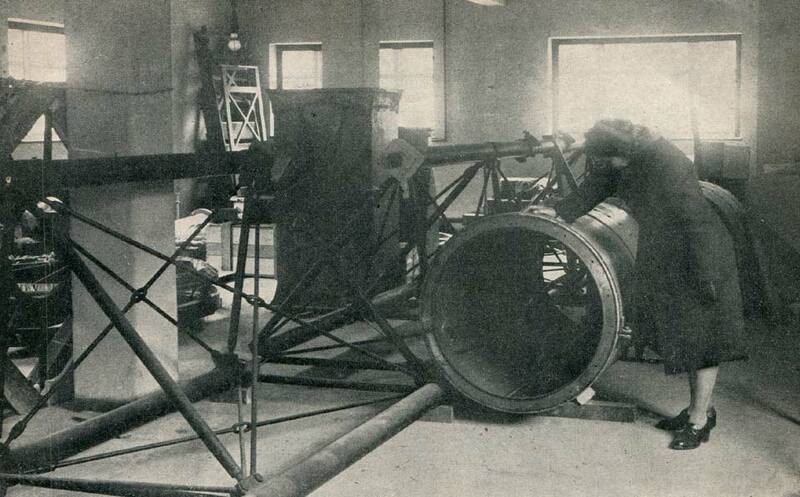 The main instrument to be housed was the Cooke Reversible Transit Circle. Commissioned in the early 1930s, it never came into proper service at Greenwich – much staff time having being spent instead on resolving technical issues and analysing instrumental errors. A second, newly acquired Reversible Transit Circle from the recently closed Melbourne Observatory in Australia was scheduled to be erected alongside, for differential observation. The original plan was to install the Melbourne instrument first in a new purpose built pavilion. The goalposts then began to move, and it was decided instead to install the Cooke RTC in a new pavilion (designed with good thermal insulation, but low heat capacity in mind), and then re-erect its old pavilion from Greenwich for the Melbourne instrument. By 1955, the Greenwich pavilion was deemed to be too problematic to adapt, and a new pavilion was being proposed for the Melbourne Instrument. It was not however to be. With the arrival of Woolley as Astronomer Royal later that same year, all plans for the Melbourne instrument were quietly abandoned. It was returned to Australia in 1978. 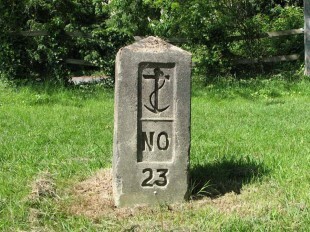 A priority for both Spencer Jones and the Ordnance Survey was to fix the precise co-ordinates of the RTC, relative to the Airy Transit Circle at Greenwich. Although the Observatory was moving, the Prime Meridian wasn’t. Nor was there going to be any alteration to Greenwich Mean Time. By knowing the precise locations of the meridian instruments at Herstmonceux, offsets could be applied and the continuity of the Greenwich Time Scale maintained. The coordinates were fixed though two programmes of observations; one astronomical, the other trigonometrical. 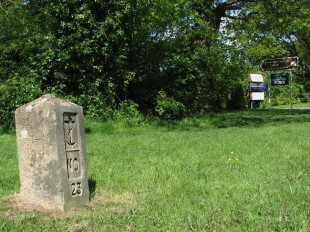 The trigonometrical procedure involved a programme of observations at Greenwich with the Airy Transit Circle of the meridian mark to its north at Chingford, along with the erection of a special azimuth mark for the telescope at Herstmonceux and several triangulation pillars (trig points). Click here to read more about the trigonometrical programme. The second of the smaller pavilions was originally built for the Bamberg Broken Transit, which at that time was still in Abinger with the time-service. This instrument was never installed. 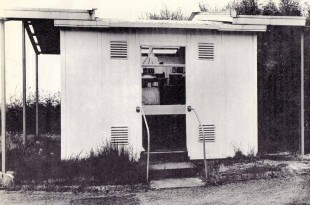 The building was used instead to house the small reversible transit instrument used for time determination that transferred from Greenwich on 23 April 1957. This instrument remained in use until 21 October, when its role was taken over by the PZT. The pavilion was then modified to house the Danjon Prismatic Astrolabe that had been acquired in 1956. This was eventually installed in the summer of 1959 and temporarily took over the role of the PZT in 1962/3 whilst the later was being upgraded. It was transferred to the Cape Observatory in 1964. The pavilion for the Cooke RTC was completed along with the other pavilions in the group in 1955. The RTC remained in use until April 1982 and the PZT until the end of June 1984. Both were then mothballed by the National Maritime Museum, with a view to putting them on public display at Greenwich in due course. This didn’t happen. The RTC was instead transferred to the Copenhagen University Observatory for use in developing software for La Palma. The PZT went to the Science Museum and its control building let to a local firm. Once the RTC had outlived its usefulness in Copenhagen, in about 2005, it was offered to the National Maritime Museum, who declined it on the grounds of lack of space. It was subsequently transferred to the Science Museum. Today, the pavilions are used for storage and are largely hidden from view by the forest of trees that were planted around them. Standing close to the western boundary of the Herstmonceux estate, and to the south-west of the Castle, the West Building was built as a permanent home for the Chronometer Workshop, Electronics Workshop, Engineering Workshop, Nautical Almanac Office and Time Department. Utilitarian in nature and in the shape of a zigzag, it had four floors in total. Set into the hillside, it was a large building with a floor area of 57,850 square feet and measured about 300 feet by 180 feet at its extremes. Construction commenced in 1954 and was completed in 1957. The Works Pound was located nearby. 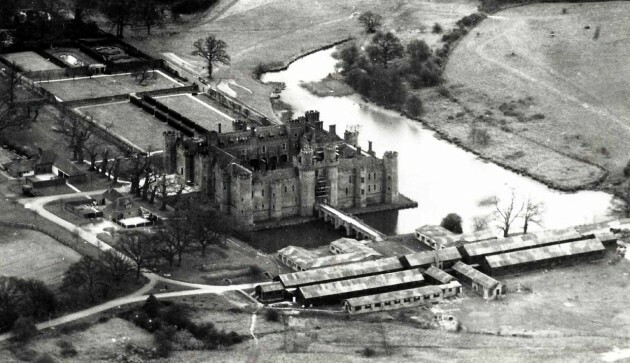 Once the various departments had moved in, the temporary buildings in front of the Castle that they had previously occupied were demolished and the site at Abinger given up. 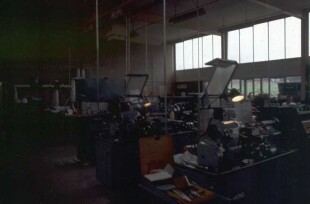 The physics department was set up at the start of 1969 to develop image tubes for astronomical use. A new building (the Physics Building) was ready for occupation by November to house not only the new department, but also the Instrument Development Department and the Drawing Office. In addition to general laboratory and office space, its facilities included a clean area for the assembly of tubes, ultra-high vacuum pumping equipment for tube processing, a dark laboratory for tube testing and a small workshop. The West Building was extended in the late 1970s. Following the closure of the Herstmonceux site, the building was converted in the 1990s into an accommodation block for its present owners, the Queen’s University of Ontario. It is now known as the Bader Building. 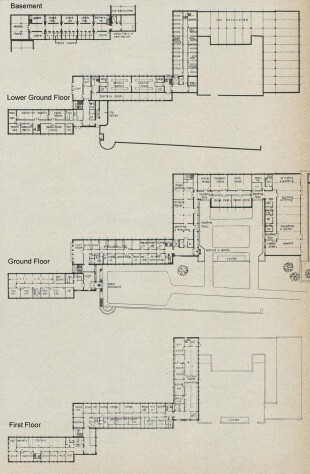 By 1952 the original three stage building programme had been reconfigured into four with a possible additional fifth stage consisting of housing and permanent hostel accommodation. The estimated cost of stages 1 to 4 had risen to about £900,000, with an additional £100,000 being required for stage 5. Although their precise scope was prone to vary over time, Stage 1 consisted mainly of alterations to the Castle and hutments; Stage 2, the construction of the Meridian Group and Meteorological Compound; Stage 3 the construction of the Equatorial Group and stage 4 the construction of the Time and Nautical Almanac Building (the West Bloc). By 1956, stage 5 had been dropped, and the estimate for stages 1 to 4 increased to £1 million. This was increased by a further £100,000 in 1958 to £1.1 million – nearly five times the provisional estimate that had originally been made back in 1945. The costs at this point broke down as follows: Stage 1, £44,200; Stage 2, £63,000; Stage 3, £342,000 and Stage 4, £550,000. increases in costs as a result of delays and uncertainties that arose due to the ‘attitude’ of the architect. As a result of the latter, the contractors had to constantly ‘chop and change their arrangements’ and submitted claims for the additional costs to them of this ‘interference’. The final settlement for this was of the order of £100,000. The whole saga was damaging to the Admiralty, British Astronomy and more crucially, the Observatory’s long term prospects of remaining a major player in the field – prospects which were worsened further by the events surrounding the parallel building of the separately funded Isaac Newton Telescope (see below). The whole sorry episode of the transfer to Herstmonceux with its long delays and cost overruns was twice referred to the Parliamentary Accounts Committee, who questioned amongst other things the wisdom of moving everything to Herstmonceux, rather than retaining some functions at Greenwich and why a greenfield site hadn’t been chosen. For most people, the name of Isaac Newton conjures up visions of a great scientist. For the Royal Observatory, the name has often been associated with trouble. So it was when Flamsteed fell foul of Newton in the early days of the Observatory, and so it was again, when the tercentenary of his birth came to be celebrated in the 1940s. The legacy of those celebrations was the 98-inch Isaac Newton Telescope (INT) … and with it, the eventual closure of the Royal Observatory. Other things being equal, the tercentenary celebrations should have taken place in 1942. The war caused their postponement and they eventually commenced on 15 July 1946. 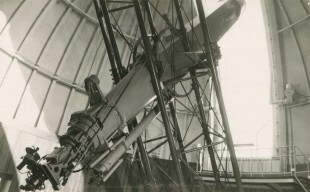 At the end of the war, a proposal emerged via both the Royal Society and the Royal Astronomical Society for a large reflecting telescope for the use of all British Astronomers. A suggestion that the proposal should be linked with the forthcoming tercentenary celebrations of Newton – the man who had built the first reflecting telescope – fell on receptive ears. On the first day of the celebrations, it was announced that the Chancellor of the Exchequer had agreed to ask Parliament to vote funds for an observatory with a 100-inch telescope to be known as the Isaac Newton Telescope. An independent Management Board was set up. Chaired by the Astronomer Royal, it met for the first time in July 1947. The site chosen for the telescope was Herstmonceux – it had after all only recently been chosen as the best available site in England for the Royal Observatory itself, and half the funding was in any case to come from the Admiralty. In 1949, a gift of a 98-inch mirror blank that had been cast in 1936 was received from the Trustees of the McGregor Fund in America. Progress on the project was slow, and faltering – partly because the promised funding was only released in tiny dribs and drabs, and partly because the telescope was being designed by committee without a properly designated project leader. When Spencer Jones retired at the end of 1955, little real progress had been made. One of the first acts of his successor Woolley was to simplify the design. By the summer of 1966 – a further ten years having passed – the fabrication of the telescope in Newcastle was virtually complete, the hemispherical framework for the dome was in place and the drum partially clad. The telescope was inaugurated by HM The Queen on 1 December 1967. In all, the telescope had taken over 20 years to build – and during those years, the number of universities in Britain had doubled and travelling to overseas destinations had become both cheaper and subject to fewer bureaucratic restrictions. From the start there had been ongoing criticism of the project, many believing that the telescope should never have been sited at Herstmonceux, but at a better location overseas. In the end, these critics got their way. The observing programme with the INT at Herstmonceux ceased in 1979 and the telescope was re-located (in modified form) to La Palma in the Canary Islands. Satellite Laser Ranging (SLR) originated in the United States in 1964. By measuring the journey time for a pulse of laser light to travel to and from a satellite carrying a retro-reflector, the distance to the satellite at any moment in time can be determined. By combining observations from base stations around the world, variations in the Earth’s rate of rotation can be deduced, along with other important scientific data such as tectonic plate movements. The satellites which are tracked, orbit the Earth at heights between 400 and 20,000 km. They fall into four main groups: geodetic, gravitational, altimetry and navigation. The Lageos satellites are an example of a geodetic satellite – the name being an abridgement of Laser Geodynamic. They look like giant golf balls. They are made of aluminium-covered brass and are fitted with numerous retro-reflectors. They have a diameter of 60 cm, a mass of 411 Kg and are in highly stable and predictable orbits at an altitude of 5,900 Km. The dome of the redundant Solar Building, was removed in early 1981 and replaced with one of clamshell design – a design in which the dome does not rotate; both halves folding back instead on a common hinge, like a two-sided eyelid. A 50-cm Cassegrain receiving telescope was installed on 3 July 1981 and the laser in April 1982. The first return signals were detected at the end of March 1983, with the system becoming fully operational by October the same year. A contribution towards the running costs was made by the Department of Trade and Industry (DTI), the Ministry of Defence (MoD) and Natural Environment Research Council (NERC). 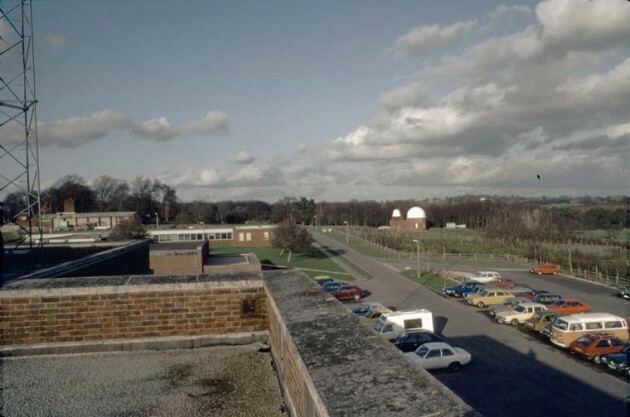 A military radar on loan from RSRE Malvern was mounted on the roof of the control room to detect any aircraft that might fly into the laser beam, necessitating a temporary shutdown of the laser in order to prevent anyone looking into the beam and being blinded. An additional visual watch was kept for low flying aircraft and gliders. 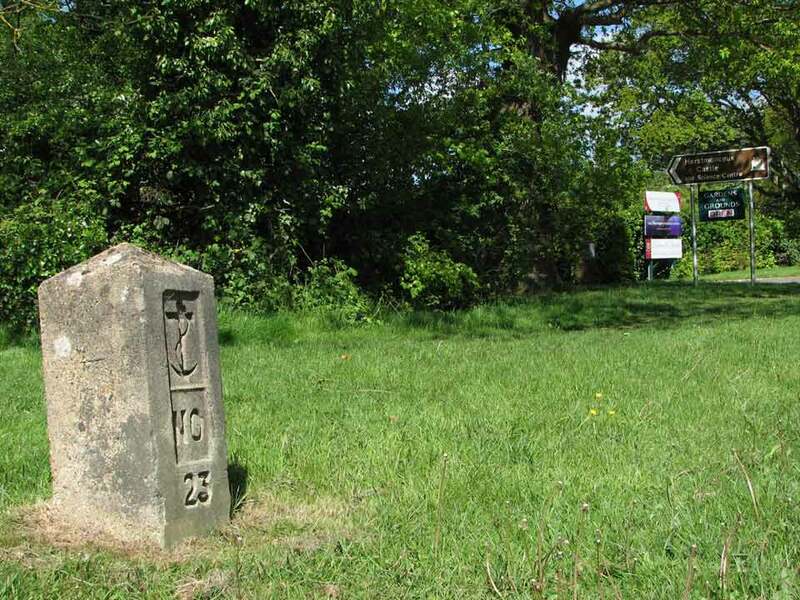 The Ordnance Survey placed a trigonometric pillar (solar) near the building and linked it trigonometrically to the pillar (Herstmonceux) near the Isaac Newton Telescope dome so that the UK network could be linked accurately to the international network. When the Observatory vacated the site at Herstmonceux in 1990, this one facility was retained, a small hut being built alongside to provide office accommodation to replace that lost in the West Building, which was sold with the Castle. When the RGO was shut down completely in 1998, the facility was taken over by NERC (Natural Environment Research Council). In April 2013, it became part of Earth Hazards and Observatories research theme under the management of the British Geological Survey (BGS). Its purpose remains much the same as before. Click here to read about the current facility and find out about the satellites being tracked today. When the Admiralty purchased the estate, the Castle was accessed via a track that ran more or less east-west from the West Lodge on Church Road to the East Lodge on Wartling Road. The section from the West Lodge to the Castle is now known as Flamsteed Road and from the Castle to the (now former) East Lodge as Halley Road. 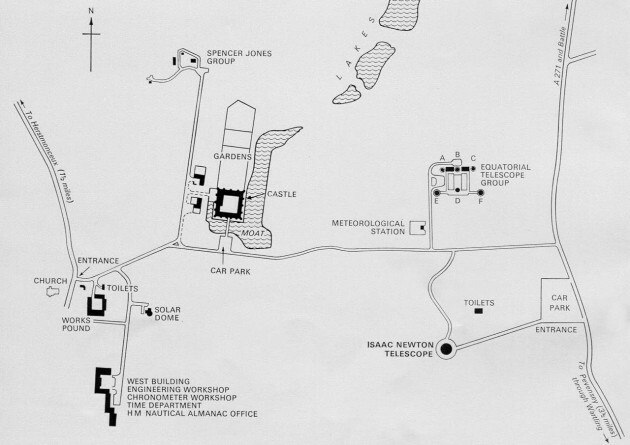 From these two roads, four new access roads were eventually constructed to give access to the different parts of the site – Bradley Road to the Equatorial Group, Maskelyne Road to the Solar Dome and West Building, Airy Road to the Spencer Jones Group and an unnamed road to the Isaac Newton Telescope. According to Roy Wallis, the Fine Arts Commission dictated that they should be the width of a track (1½ Cars) and only after a fight did they concede the provision of passing places. Vehicular access to the Castle grounds today, is normally made from Wartling Road. When the Observatory took over the estate at Herstmonceux, it was relatively open, with the Castle nestled in a gentle valley with open fields on either side. 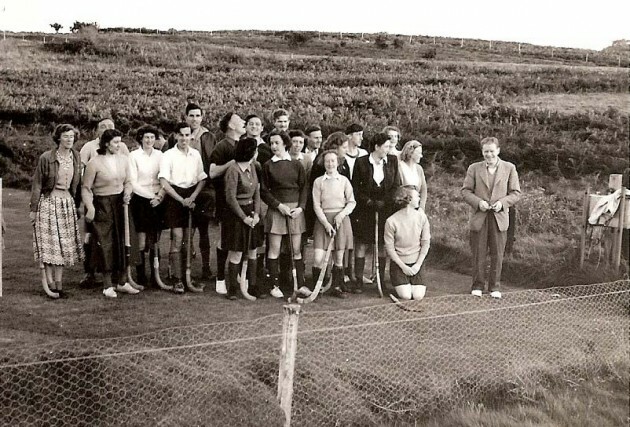 In the early 1950s, a major programme of tree planting began – primarily with the aim of protecting the telescopes from atmospheric disturbances that would otherwise have arisen as a result of the heating of the ground by the Sun during the day. In all, over a quarter of a million trees are said to have been planted. Probably the most recent are the five acres of Scotch Pine, Beech and Chestnut planted around the Isaac Newton Telescope in 1962/3. Now approaching maturity, the top of the dome towers majestically above them. Being somewhat lower, the surviving buildings of the Spencer Jones group and the old Solar Dome – which so offended the locals when originally built – are now virtually hidden from view. Ironically, the trees to the south of the old Solar Dome needed to be reduced in height following the installation of a purpose-built GNSS receiver by the Ordnance Survey as they interfered with reception. Included in the grounds were formal gardens of just over one hectare. Divided into three main sections, and located immediately to the north of the Castle, they also contained a tennis court. 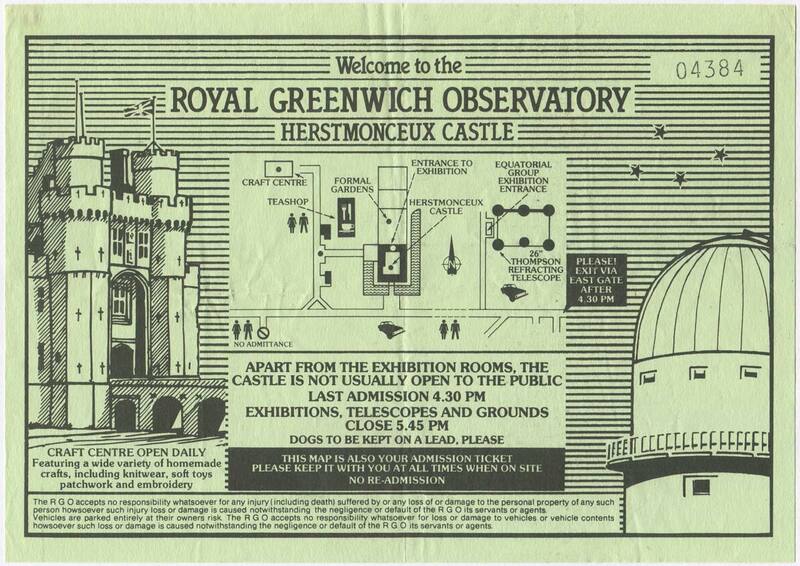 The grounds and gardens which can still be visited today were first opened to the public by the Observatory in 1950. Back then, the entry charge was one shilling a person and the gardens were open only on Wednesday and Thursday afternoons between April and October inclusive. The gardens now contain a stone bust of John Flamsteed. Nearby is a large Reclining Equiangular Sundial originally erected in 1975 to celebrate the Observatory’s tercentenary. Constructed by Morfax Ltd an engineering company from Mitcham in London, it was relocated with the Observatory to its new site in Cambridge before being returned to Herstmonceux following the Observatory’s closure in 1998. Within the Castle courtyard, there were two large lead tanks which were transferred from Greenwich at the time of the move. Made when Flamsteed house was being enlarged for Maskelyne, they were originally used for storing rainwater for drinking. At Herstmonceux they were planted with flowers. 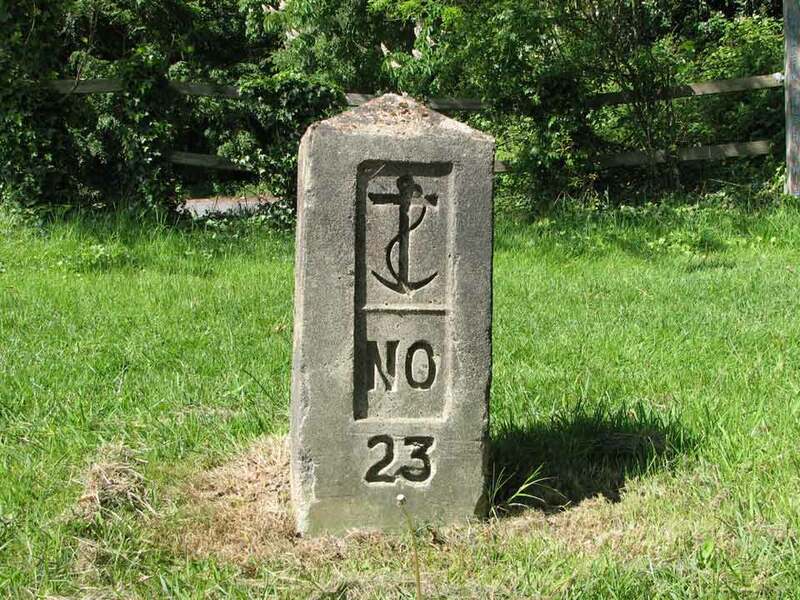 They carried the date 1790 together with the arms of the Observatory’s then funder – the Board of Ordnance (three cannons). The tanks were moved to Cambidge when the Castle was sold and were subsequently transferred to the National Maritime Museum. Click here for more information on current opening times of the gardens. 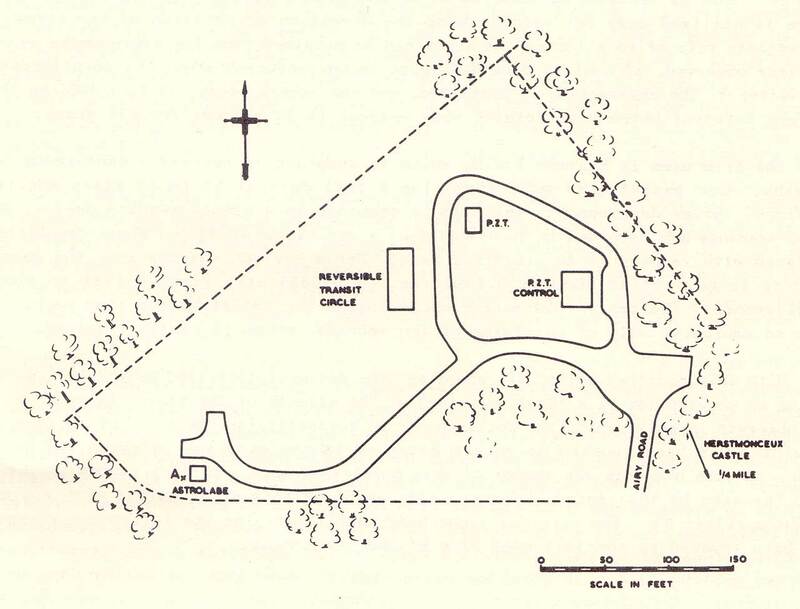 The RGO Clubhouse was built opposite the West Lodge (on the other side of the driveway) between 1959 and 1960. It was formally opened on 1 October 1960. The club, which was originally known as the Royal Observatory Social and Sports Club was formed on 28 October 1948. The Club played an important part in the lives of many of the staff, particularly in the early days. Prior to the building of the Clubhouse, the Club had been based in the wartime hutments, with ocassional use of the Castle ballroom. 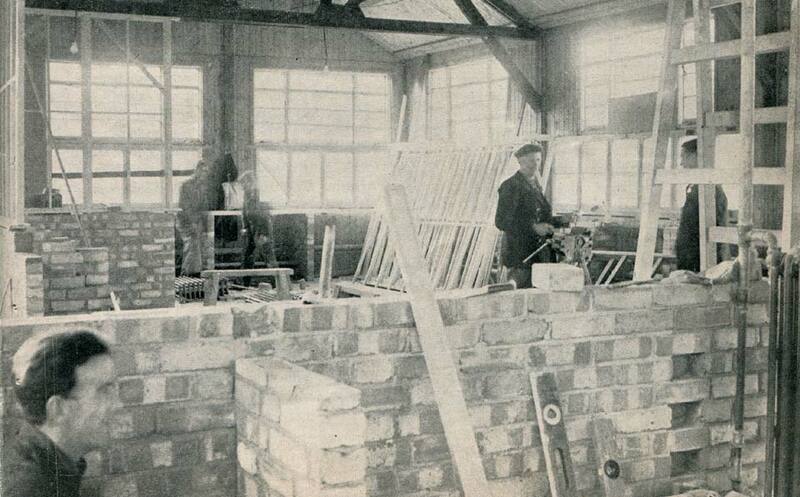 With the hutments due to be demolished in 1957/8, local fundraising began to raise money for the erection of a purpose-built clubhouse. The Clubhouse was paid for and built by its members. 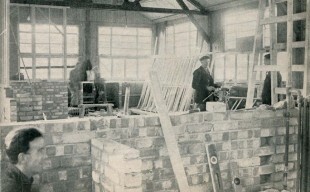 In the interval between the hutments being demolished and the new Clubhouse being completed, the Club had ocassional use of the Long Gallery in the Castle and the new canteen in the West Building. George Wilkins has written extensively about the club and its activities in his Personal History of the Observatory (appendix D). Click here to read more about the Hockey Club. The cricket pitch was located immediately to the east of the Castle, on what was originally sloping ground. This was levelled by staff. According to Bill Nicholson, the pavilion in the north-east corner was built from materials that they reclaimed from a small tin-roofed church that was being rebuilt at Bexhill. The cedar cladding was provided by the contractors who were building the West Building and Equatorial Group. The buildings as recorded by British Pathé. British Pathé made at least four visits to film at Herstmonceux. Video clips are posted on their website, and can be accessed via the links below. 1957. Filming (or preparing to film?) one of the Sputnik satellites from Herstmonceux. A previously unreleased clip showing Chief Assistant Olin Eggen with the 30-inch Thompson Reflector. Sputnik 1 was launched on 4 October 1957 and Sputnik 2 on 3 November 1957. Pathé state on their website that Eggen was trying to photograph Sputnik 2. However, a conspicuously similar press image of Eggen with the telescope was released on 9 October. Given the generally poor documentation of the Pathé films it is difficult to know exactly when this movie was shot and which of the satellites Eggen was trying to photograph. (B/W, running time: 3 min 14 sec). 1958, November 14. Visit by the HRH, Prince Philip, Duke of Edinburgh. Slow moving to start with this unedited clip shows: the equatorial group, the Castle, the solar dome, the arrival of the Duke (who is greeted by the Astronomer Royal, Richard Woolley), the Duke looking though the 28-inch refractor, a tour of the chronometer department with George Rickett, and a visit to the Cooke RTC. Although today, the equatorial group the Castle and the old solar dome are well screened from each other by trees, at the time this film was made, the trees are conspicuous by their absence. (B/W, running time: 6 min 16 sec). 1963, June. This clip shows: the Castle, the equatorial group, the 36-inch Yapp Reflector, and the photoheliograph in the solar dome. Note: there are no external views shown of the solar dome. (Full colour, running time 1 min 22 Sec). 1967, December. The Isaac Newton telescope. (Running time 1 min 14 sec).